Happy International Raw Food Day! I can see you raising your eyebrows at this… Yes, today is International Raw Food Day — a day launched by Raw Food Coach, Karen Knowler from the UK. The point of the day is to encourage people to either go raw for a day, or at least do some research on what eating more raw foods can do for your body. If you are asking about when this started, I can’t tell you because I just found out about this date myself a few days ago. So now I’m passing it on to you. 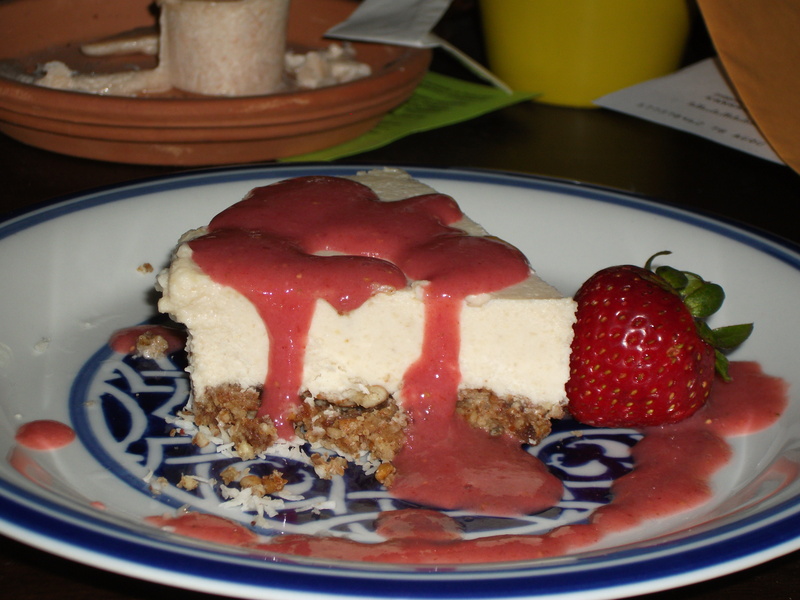 The one raw food recipe that got me truly excited about raw foods was CHEESECAKE! Let me tell you, I have never been a big dessert person. This is most likely because I don’t care for syrupy sweet things overdone with lots of sauces and toppings. However, some months back I went into my favorite health food store and I saw a slice of lemon vegan cheesecake in the fridge. I’m telling you it looked like regular cheesecake, but I was thinking, “it’s probably gross…” Having just got paid and being the adventurous eater I am, I decided to give up $6 for one slice. I took my bag of groceries and my $6 slice to the car, pulled out my plastic fork, and dug in. Let me tell you, the moment I put that cheesecake into my mouth, I closed my eyes, put my head back, and thanked God for something so delicious. I think a tear even came to my eye. The cheesecake was so creamy and fluffy, the lemon was nice and tart, with enough sweetness that didn’t overpower the cheesecake. I absolutely had to learn how to make this for myself. The beauty of this is that you can eat this for breakfast without feeling too bad about it. I made this when I was still fairly new to raw foods, so there is no reason for you not to try to make this or some other easy raw food recipes. What recipe first made you excited about raw foods? I sold my microwave. I didn’t use it, really. Aside from all the reasons why a person shouldn’t use a microwave, I NEVER bought microwaved meals anyway. And I didn’t really reheat anything in it either. So what was I keeping it for??? This revelation came after thinking that if I was going to spend more time getting reacquainted with food and cooking, I’m going to need to make some room for healthier things. I’ve got a beautiful shelf/countertop built by my beau (I’m too old for a boyfriend…) using scrap wood pieces — and I absolutely love it. He quadrupled my working space with one piece of wood. He also nailed a simple piece of wood under my cabinet to give me a little extra space to put my spices. I teared up when he showed it to me. I finally got rid of that old crappy blender that never really blended anything right and replaced it with a Vitamix (!). I’ve been salivating over that Vitamix for several years now. I’ve been reading so many vegan bloggers who have had the same Vitamix for 10 to 15 years! Well worth the roughly $500 investment if you know you’ll use it all the time. I got a great deal from QVC while watching In the Kitchen with David (that man can sell the hell out of anything…). The counter space that held the microwave will soon hold a fruit and vegetable dehydrator — I may have to wait a few months for that though. What a HUGE leap from what I was doing a year ago! One year ago, today, my ex-husband left to go God knows where. I had been so depressed, even before he left that I couldn’t tell you when the last time I put together a halfway decent meal. I noticed the other morning while preparing a watermelon and cantaloupe smoothie that I felt so grounded cutting up all that sweet, juicy goodness. I thought to myself, “YEAH! I could do this all day!” But alas, I had to go to work. Here’s a little Roy Ayers with Brand New Feeling — because I’m loving me!